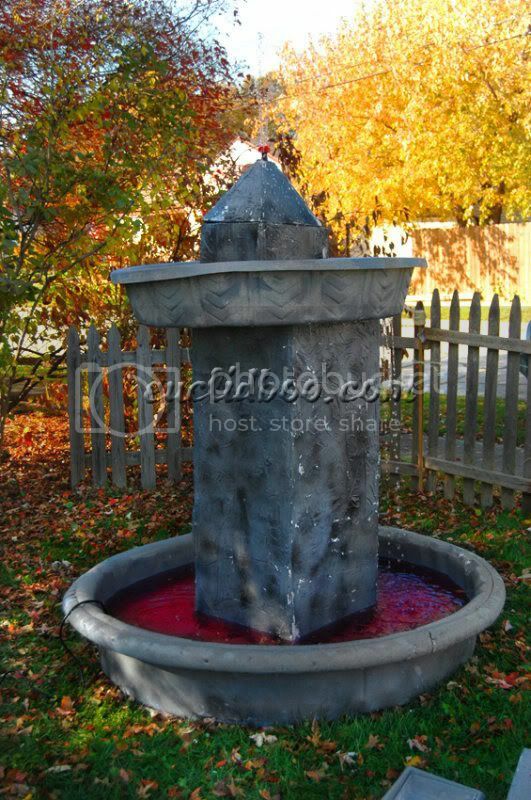 One of the longtime features and frustrations of our yard haunt has been the “Fountain of blood” which currently occupies a large amount of area in our cemetery. This feature is massive and requires a bit of space to store as well as some parts that are costly. Your best bet for construction of a fountain of this scale is to search people’s fall trash and the internet for materials. We were fortunate enough to find our pools in the trash. Once completed and functional it makes a grand addition to a foggy cemetery. Paint your wading pools with that big can of battleship gray you’ve purchased. Accent them with black, white or whatever other color you want. The key is to make them look less like pools and more like they’re made of stone… old stone. Cut your 4×8 plywood in half (both sheets) to make 4 4×4 sheets (we went larger, and so can you if you have the materials available) and cut your 2x4s in half as well. Assemble a box with 4 sides (the top and bottom are left open) using the 2×4’s as your frame for the panel sides. Once assembled, cut small half-circle shapes into the bottom of the box to allow water flow. It would probably be a good idea to water seal the inside of the box (at least the lower end) but since we’re only up and functional for a few hours a year, we’ve never done anything like that. We did, however, coat the outside of the box with a paint and plaster mixture before we did the final paint. It really doesn’t help much and we probably should shellac it or something, but it is what it is. Using a sharp knife, plunge cut a star shape into the center bottom of the smaller wading pool, this will allow the tubing to pass through. Using a large drill bit, drill equidistant holes into the bottom of the smaller pool (usually 1/4″ will do) around the outer bottom rim. This allows for the water to flow from the top pool back to the bottom, fountain style. Place the bottom pool into position, place the pond pump with outlet tubing into the center of the pool, place the wood box over the pump/tubing. place the top pool into position and push the tube through it. We built a smaller box with a diamond peak to put on top of the smaller pool. It helps the look but it is not necessary. Place your fountain head into the long outlet tube end (a bit of duct tape may be required to hold it in place). Fill the bottom pool with water make sure there is enough so the pond pump does not run dry, and color your water the best way you know how. We like to use 5 packets of cherry and 5 packets of grape drink mix, followed by a small bottle of maroon food coloring. Turn on your pump and more than likely you’ll have to reposition your top pool to keep it from tilting to one side or the other. If you’re not getting enough water back to the bottom, drill more holes into the top pool. For added fog effect, you can add dry ice to the top and bottom layers. It does work nicely! 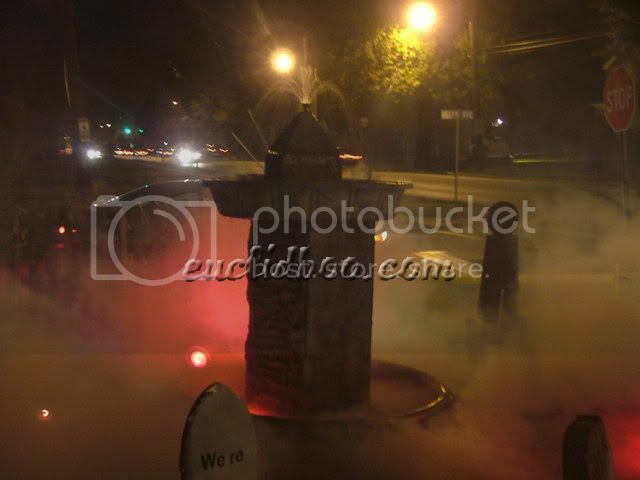 We’re probably going to redesign our fountain of blood some day, I’ve given some thought to turning the pool of water into a makeshift fog chiller as well (eliminating the use/expense of dry ice).